Rhina P. Espaillat’s And after All meditates on the passage of time. The perspective sweeps from the panorama of foreign landmarks to the close view of a lover’s feet in failing health, held and cared for. And after All displays the wit, wisdom, subtle voice, and supple mastery of forms that have established Espaillat as a contemporary master. This long-awaited collection from Espaillat is a treat not to be missed. 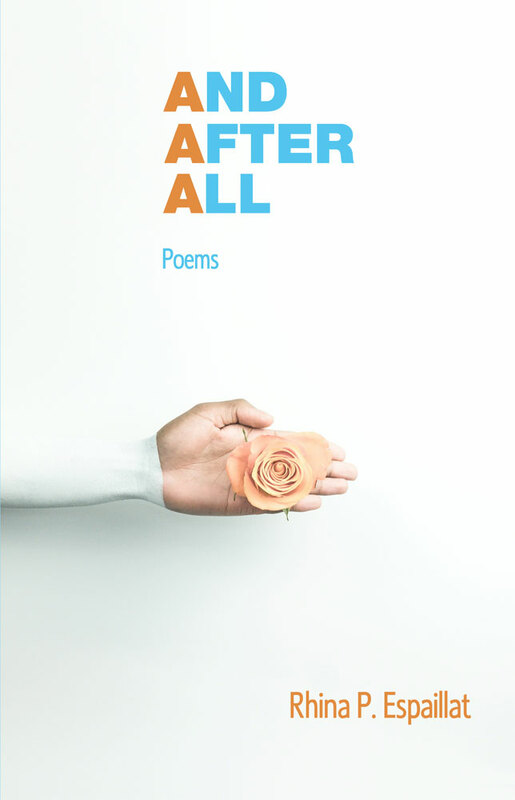 Rhina P. Espaillat’s And After All combines the formal fluency of Richard Wilbur, the precision of Elizabeth Bishop, and the easy conversational tones of Frank O’Hara, and yet her poems speak in a voice that is distinctively her own. They address the loss of loved ones and loved things of the world, but their extraordinary empathy and gentle wit keep them from becoming depressing or sentimental. Savor this book and share it with people you love. Rhina P. Espaillat, more than any living poet in English, gives ordinary language the glow of the sacred. Workaday words, trite with custom like thin coins, accrue new resonance and weight; plain objects are haloed with aureoles like figures in gold mosaics. Saints with their visions used to do this: wave away the veils that separate our shallow perceptions from a deeper reality. But not everyone is granted visions. How much harder it is to use the same words we all use and misuse, the same objects we all touch and ignore, common experiences we dismiss, and, by using words with precision, using the serendipity of rhyme, and the convention of metrical patterns, to give the reader the experience of revelation. Craft is not the opposite of inspiration, Espaillat reminds us, it is the only way to it. 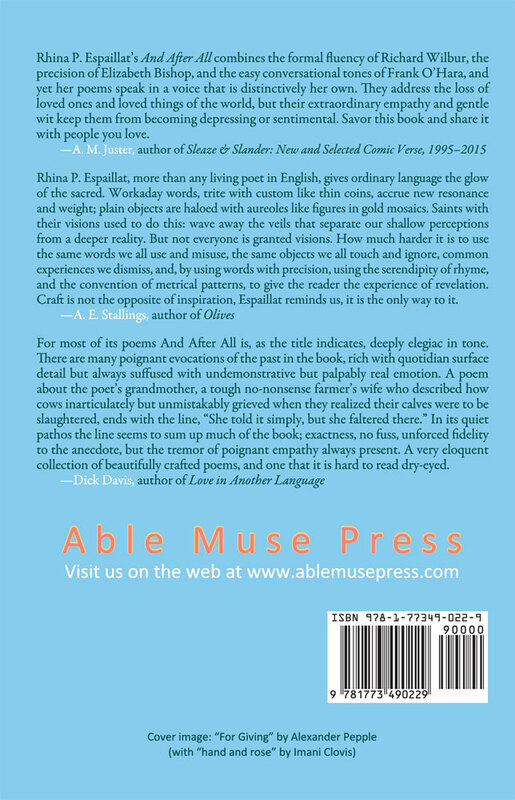 For most of its poems And After All is, as the title indicates, deeply elegiac in tone. There are many poignant evocations of the past in the book, rich with quotidian surface detail but always suffused with undemonstrative but palpably real emotion. A poem about the poet’s grandmother, a tough no-nonsense farmer’s wife who described how cows inarticulately but unmistakably grieved when they realized their calves were to be slaughtered, ends with the line, “She told it simply, but she faltered there.” In its quiet pathos the line seems to sum up much of the book; exactness, no fuss, unforced fidelity to the anecdote, but the tremor of poignant empathy always present. A very eloquent collection of beautifully crafted poems, and one that it is hard to read dry-eyed. Rhina P. Espaillat has published ten full-length books and three chapbooks, comprising poetry, essays, and short stories, in both English and her native Spanish, and translations from and into both languages. Her work appears in many journals, anthologies, and websites, and has earned national and international awards, including the T. S. Eliot Prize in Poetry, the Richard Wilbur Award, the Howard Nemerov Prize, the May Sarton Award, the Robert Frost “Tree at My Window” Prize for translation, several honors from the New England Poetry Club, the Poetry Society of America, the Ministry of Culture of the Dominican Republic, and a Lifetime Achievement Award from Salem State College. Espaillat’s most recent publications are two poetry collection in English titled Playing at Stillness and Her Place in These Designs; a book of Spanish translations titled Oscura fruta/Dark Berries: Forty-Two Poems by Richard Wilbur; and a book of Spanish translations titled Algo hay que no es amigo de los muros/Something There Is That Doesn’t Love a Wall: Forty Poems by Robert Frost. She is a frequent reader, speaker and workshop leader, and is active with the Powow River Poets, a literary group she cofounded in 1992.